There’s a doomsday scenario that has the college football world buzzing. I won’t lie. It’s intriguing. It would definitely prompt more debate than we’ve ever seen come Selection Sunday. Do I think it’ll happen? No. But am I going to dissect it endlessly as if it’s going to happen? Sure. What else do I have to do? If you haven’t seen this scenario, here it is: Undefeated Alabama loses to 1-loss Georgia in the SEC Championship, and basically, all hell breaks lose. Again, it won’t happen. It’s still early November. It never happens like this. So who gets left out in that scenario? My guess is Michigan and Oklahoma. A lot of people would say that the only nonconference champ with a loss (Alabama) should be left out. I’d disagree with that. That’s because after what we saw the Tide do Saturday night in Baton Rouge, nobody deserves to have a loss to give more than Nick Saban’s squad. That’s not because it won a national title last year despite the fact that it neither won its conference or even its division. This is about résumé. 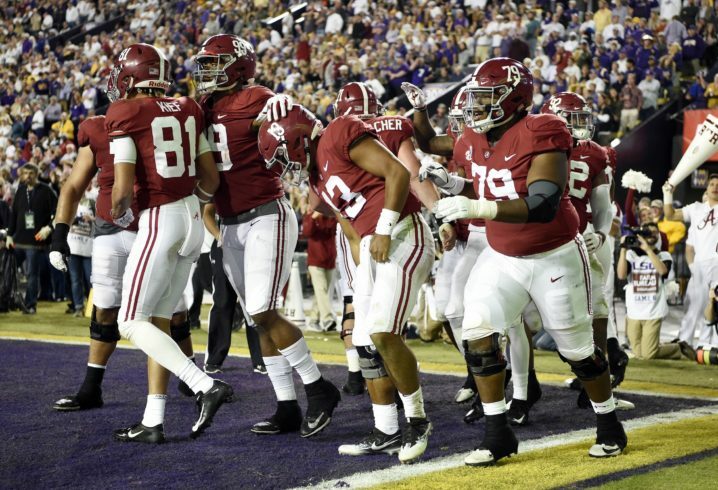 Right now, Alabama’s dominant win at LSU is a major trump card. No team in America has a better win. Period. I’d argue that because it was a true road game, no conference championship outside of Georgia taking down Alabama would be a better résumé-boosting victory. I realize this is even strange to talk about considering we have yet to see a 1-loss Power 5 conference champ get left out of the field. You’ll notice that I didn’t even include Washington State in that discussion because with how awful the nonconference slate was, I don’t think the selection committee would reward the Cougars instead of any of those aforementioned teams. But 1-loss Alabama is the team that can be favored ahead of a 1-loss conference champ for a variety of reasons. The fact that the Tide came in at No. 1 before the LSU game shows that the selection committee was amazed by the level of dominance in the first 2 months. As it should have been. We’re talking about a team that has won every game by at least 22 points, 6 of which were against Power 5 teams (before LSU). Forget the cupcakes. Alabama is +243 in 7 games against Power 5 teams this year. That 2016 team — widely considered one of the most dominant ever up to the title game — was +233 in 9 games vs. Power 5 teams going into the SEC Championship. Perspective is key with all of this. Remember 2001 Miami? Some believe it was the best team of all-time. That group had an average margin of victory of 33.1 points vs. Power 5 teams (the Big East wasn’t the SEC, either). What about 2004 USC? That group was only at 22.4. Alabama is at 34.7. You’d probably have to go back to 1995 Nebraska to find a team more dominant. That’s worth something. When you consistently beat Power 5 teams like a drum — even better if they’re ranked and on the road — the selection committee notices. Not to pick on Notre Dame, but beating Vanderbilt by 5 at home isn’t the look of a Playoff team. Going into Death Valley and pitching a 29-0 shutout is. Don’t tell me that margin of victory is useless. It’s part of it. There’s a reason that Saban said after the LSU game that his team wanted to “make a statement” to those who were questioning their schedule. In the biggest game of the college football season, his team did just that. The loudest possible statement that Michigan can make is going into Columbus and dropping the hammer on the Buckeyes. 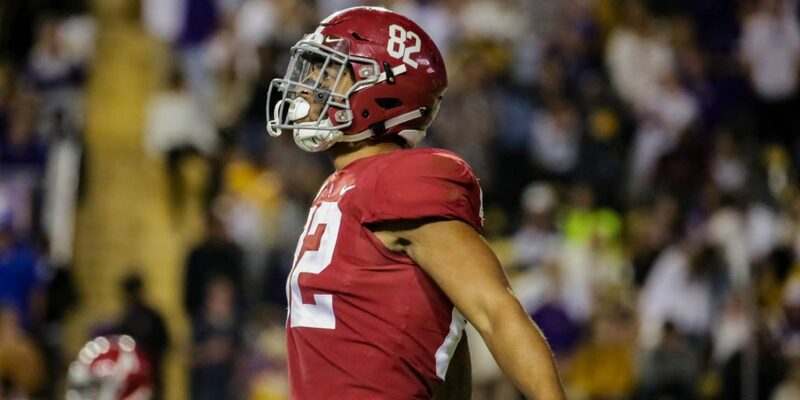 It would be a loud statement just to win, but would it be like what Alabama did at LSU? Given the flaws of an Ohio State team that isn’t very battle-tested — unlike LSU — I’d say it’s not. And Michigan won’t move the needle by beating Northwestern in the B1G Championship. Remember that we’re talking about a scenario in which Alabama, Michigan and Oklahoma all have 1 loss. With Alabama potentially able to rack up at least 2 more wins vs. ranked foes (assuming 1 of 3 potential Top 25 matchups is a loss), it’s not like we’ll be talking about LSU as its lone quality win. Either way, that’ll still count for a whole lot considering the committee had the 1-loss Tigers ranked ahead of unbeaten Notre Dame. Alabama already disproved the notion that a November loss is a Playoff death sentence, and the fact that teams with losses to mediocre opponents have still made it in should squash any notion that a stunning loss to a ranked Mississippi State team would be a deal-breaker. So yeah, let’s cool it on that before it starts. This is all a conversation worth having because of last year. 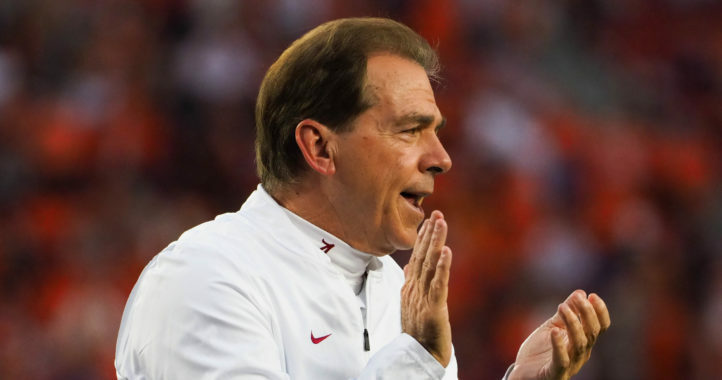 Last year, Saban had to sweat out watching his team lose 1 game and sit idle without a chance to improve the Tide’s résumé in the final weekend. That’ll be different this year. That much we know. What we don’t know yet is what an Alabama earthquake would register on the Playoff Richter scale. Better yet, we don’t know if an Alabama earthquake is coming at all. Nothing suggests that’ll happen before the Playoff field is announced. But earthquakes come when you least expect them. They’re brief, stunning and can leave a lasting impact. Call me crazy, but I can’t imagine one earthquake demolishing the mansion that Alabama built so far. Well, I think most people would agree with me when I say that it would probably come down to how they lose in that scenario. Is it like last year’s SEC Championship game? 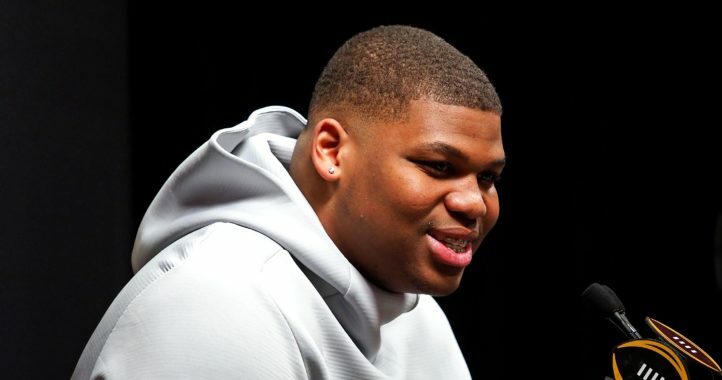 What happens if Tua gets injured, Jalen throws a crucial pick, and UGA wins a nail-biter? What happens if Michigan takes 2OT to beat whoever their cupcake is? If Georgia wins, I would want Alabama put in the same bowl as UCF, for obvious reasons. If UGA were to lose I would want them in the same Bowl Game as UCF, except they might not then qualify….having had such a large loss at LSU. David…Kirby is referring to the ever so humorous claim that UCF was the National Champion last year AND the fact that they claim that they could ‘hang’ with Alabama. Kirby wasn’t trying to be funny or disrespect Alabama merely stating that it would be great to see them throttle UCF IF they were left out of the mix. You obviously couldn’t comprehend the satire in his post. Yes but LSU’s other loss is to a Florida team that appears to be on a downward track to end the season. Right now I think it hinges on how closely Georgia hypothetically loses to Alabama. Kirby, while that is true the loser of the CCG has always been downgraded when it comes to bowls… Maybe it would be different this year. Just look at 2012. UGA was clearly the second best team in the nation after a very close game with the team (Bama) that would go on to crush Notre Dame in the “Real” National Championship, Georgia gets put into the Citrus Bowl against Nebraska. And Florida, Who UGA beat, played in a BCS Bowl. Pretty sure it was the Capital One Bowl, actually. If anything, UCF wouldn’t qualify to be in the same bowl as us, I think. IMG Academy could probably go 9-3 with UCF’s schedule. David, like a lot of Bama fans, you are hyper-sensitive to any perceived criticism of your mighty Tide. I think Kirby was wishing Bama upon UCF to finally shut up UCF and handle them a crushing defeat. But that was a really, really good zinger about not qualifying to playing UCF. BamaTime, you’re right on time. Swooping in to protect your fellow cohorts from those who dare criticize Bama or Bama fans. I can’t comment about UGA fans trolling after the LSU loss, as I didn’t see any of that. I saw UGA fans admitting defeat to a team that flatout played better, though. DD2 isn’t a troll because I think he actually believes the nonsense he spews. But I do see your point. What nonsense, boxster355? I am so sorry for believing in my team. My god, you are one pathetic fan. All you ever do is complain and when someone like BamaTime calls you out, you immediately back down. Grow a pair, son. BamaTime everyone on this post has been calling you out…Also, please point to boxster’s UGA logo..Moron. Boxster is a UGA fan… I can’t it help you need pictures to understand that. DD2, all I ever do is complain? What the f**k are you talking about? I literally never complain. The nonsense you spew is needlessly antagonizing comments towards other fans that have ZERO basis in facts. Plus you viciously turn on fellow UGA fans — and for what?. And you know what? I don’t need a logo to show my support. I know I bleed red and black and require recognition from no one for validation. I believe in my team, but as with all things, I am very clear-eyes and realistic. If you think delusional and combative optimism means you are a true fan, than by all means go right ahead. I’ll continue to support UGA in a manner of my choosing. Ok continue to support UGA by never going to games, saying we have no chance in game a month before its played, and not even using their logo on a SEC website…BamaTime, get your son in check, I am tired of owning him. Why would someone that refuses to support him team go to a UGA game…? DD2, I assure you your weak, impotent comments have owned no one. Only in your small mind does that happen. And I do go to game as often as I can. That you would seriously attempt to claim I don’t go, while having absolutely no knowledge, is the height of stupidity. Congratulation, just when you could get any dumber, you actually do. If you ask me the SECCG should be an elimination game. It’s the first round of the playoffs. I know ND cares more about their tradition than actually winning but it’s time they join a conference. The more teams you have in the playoff, the more that will pitch a fit about being excluded. End of story. I still believe the P5 and G5 should separate and hold their own playoffs. There is an obvious quality difference between the two so why not give them both something to play for? Well, there’s a reason nobody cares about college basketball regular season, homecoming games, rivalry games, neutral site games, etc. The more you expand the playoff, the more that you lessen the value of the regular season. Virginia may have an absolutely dominate regular season that they worked hard for, only to have it come crashing down because they tripped up against a nobody that barely squeaked in. That’s why they should be considered equal to a BYU or the group of 5. LoL. The last time they played Bama, Manti Te’o (and his girlfriend) had 10 tackles and they still lost to the Tide! Perhaps the Tide should lose one on purpose in order to ‘ save ‘ college football. We could call it fakeball then. I watched as LSU was given a targeting pass lass Saturday, which was obvious to me. Head to head, launched, and at the goal line where even if the defenseless ( in spite of what the talking head said )receiver dropped the ball, it ( the ball ) appeared to have already crossed the plane. But what would poor LSU do if they lost another guy to the cheap shot rule ? The Grant Delpit play was not targeting. their heads touched but he didn’t lower his head and initiate contact to the receivers head with his own. He kept his head up, lead with his shoulder and their heads grazed. Were you watching the same play as I was or just with Crimson colored lenses? Stop being a sore winner. It wasn’t targeting. Even if it were, it’s not as if Delpit made a play at any other time that cost Bama the game. They won. By 29. Get over it. A better question, and topic for a column, is what would happen if Georgia loses to Auburn or Georgia Tech, and then wins the SEC? Would UGA and Alabama both still get in? Would an SEC champ who just beat Alabama get left out while Alabama gets in? No need to worry. You guys got two turnovers within the 10 yard line plus a 25 yard field from a pick and still needed the fourth quarter to win against an embarrassment of a Florida team on a neutral field. The only place y’all are beating Bama is in your dreams. I don’t understand it when fans are confronted with facts their common response is “typical whoever fan”. Facts are facts and are never typical. Fact: You were born in 2004 and bandwagon every good team in sports. I know it can’t happen but I wish Bama could play Michigan AND Notre Dame to shut them up THEN play Clemson in the NCG. Oklahoma is a joke. Literally eeked out wins against Tech, Iowa, and Army plus lost to a rebuilding Texas team on a neutral site where there defense couldn’t hold water with a bucket. Notre Dame is the same deal. Scraping out wins against Vandy and Pittsburg at home… what a joke. Oh yes we should definitely keep giving to bama in any circumstance where they need help. Just like last year. Bama needs all the help they can get the REC cannot do it all! Hey, Auburn gave a 4/5 loss coach an extension and raise… Bama didn’t ask for that help. Help? You mean the same way Auburn helped in losing to UCF? Which then gave them and their fan base the belief they can hang with the big boys because they went undefeated against powerhouses like East Carolina and UConn. Ok. Thanks for the help, Auburn. Whatever will y’all do next? As a bama fan i dont see bama getting in with a loss…no matter how small. It wiuld be like the lsu fanbase raising all kinda hell about bama getting special treatment by the refs. So much so that lsu had several ibvious holding penalties not called. Plus a targeting penalty overturned. Unless the committee can clearly overlook fans who dont think bama should be in then it wont happen. Fans other than those of bama have severe bama fatigue even tho even with one loss bama would still be one of the top 4 teams in the country. Redsox…Go back and read his previous posts and hopefully you will understand my comment. You can see his digression with his posts as the season progresses and his Gators can’t back up his mouth. By the way we didn’t ‘need’ the 4th quarter to win as we were ahead in the 3rd and would’ve still won without 13 in the 4th.